Apollo Group (APOL), the parent company of University of Phoenix®, today announced that it received a United States patent related to its innovative online classroom platform. The patent was awarded for the University’s new Academic Activity Stream that will consolidate student activities, engagement, and interaction into one unified learning space. The stream will showcase unique personal management features that allow students to more efficiently manage their coursework and classroom experience. Techniques are described herein for implementing an activity stream. An activity stream includes a ranked list of objects that are associated with each other. Within an activity stream, an object (such as an assignment or course syllabus) may have events associated with it. For example, a student can “comment” on an assignment. The assignment may be listed as an object within the activity stream, and the comment may be posted under the assignment, in the activity stream, as an event that is associated with the assignment. A variety of objects can appear in an activity stream, and each object may have comments and other events listed underneath. The location of an object in the activity stream changes based on events that happen in association with objects in the stream. However, rather than simply being pushed further down the list every time a new object is added to the activity stream, techniques are provided for moving objects within the activity stream in other ways. A method, comprising: generating a first ranked list of objects for an activity stream; in response to detecting a plurality of events associated with a plurality of objects, placing each of the plurality of objects in positions in the first ranked list based on the order in which the events occurred; in response to detecting a first event associated with a first object in the first ranked list of objects, moving the first object in a first position in the first ranked list, wherein the first event is associated with user activity and the first object is associated with a class; in response to detecting a second event associated with a second object in the first ranked list of objects: moving the first object to a second position in the first ranked list, wherein the second position is lower than the first position in the first ranked list; placing the second object in the first position in the first ranked list; wherein the second event occurs after the first event; maintaining the ranked list as a plurality of segments, wherein each segment is associated with a time period; maintaining a first segment that is associated with a first time period; after detecting the expiration of the first time period: causing the portion of the ranking of objects that is associated with first segment to remain static; maintaining a second segment that is associated with a second time period; dynamically updating the portion of the ranking of objects that is associated with the second segment in response to detecting a fourth event without updating the portion of the ranking of objects that is associated with the first segment; wherein the method is performed by one or more computing devices. 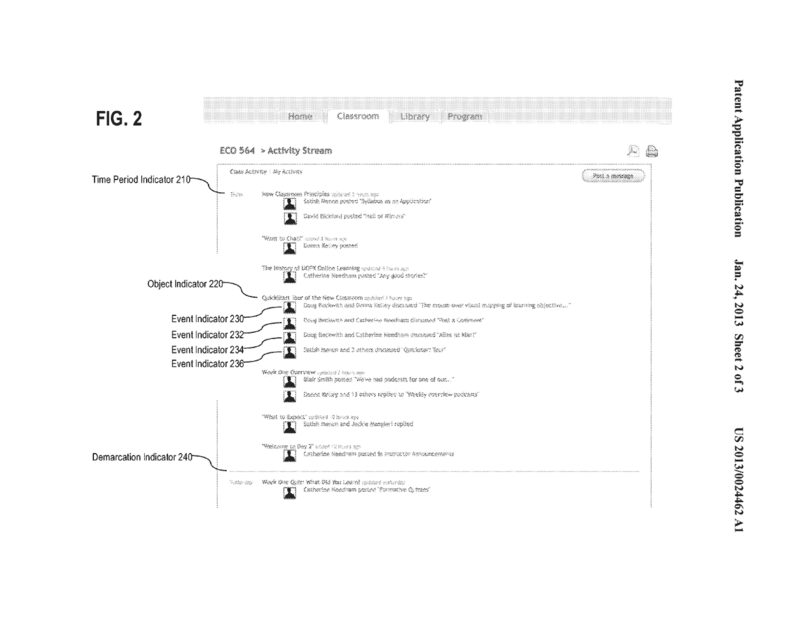 The patent lists several "embodiments" of the concept - examples of approaches that could be pursued to implement the activity stream. These embodiments include re-ranking of a book chapter based on recent student comments or preferences and notifications when 75% of students have completed an assigned reading. I haven't figure out why the patent includes descriptions of hardware-based computing devices as an embodiment of the concept. What is concerning is that this patent appears to be quite broad in its claims, bringing up the painful memories of the Blackboard patent from 2006 that was eventually invalidated. Am I reading this correctly in that it essentially patents any individualized stream within a learning platform? More to come. Discussions here or in the Google+ post. I’m working on a follow-up post that points out comparisons made in 2010 between UoP stream with Facebook ranking. At the time they seemed to view this work as applying the same concept to online learning platform, but instead of ranking for ad revenue, etc, rank in terms of individual preferences and learning needs. But … reading the patent, it’s really hard to see the tie-in to learning except references to teachers, students, learning objects. The “novelty” almost seems to be the application of idea to education. The reason for the hardware reference is so that they can establish it as a “method” patent, since business process patents are on shakier ground these days. There are a lot of bad patents out there, both within education and in general. The real question is what Apollo intends to do with theirs. It’s one thing to file for a defensive patent. Companies of any size that develop technology pretty much have to do defensive filing these days. But to have them brag about the patent is, at the very least, a little tone deaf regarding recent history in this space. the PR wasn’t for us, it was written for their investors. KEEP INVESTING. GIVE US MOAR MONEY! !one WE ARE INNOVATING AND AWESOME. yeah. but it’s a silly patent that doesn’t really do anything that anyone who is really innovating would care about. Reorganising the order of a book/activity adaptively based on profiling the behaviour of learners was something developed in a project at OUNL called “Roma” circa 2005. Not that prior art is going to be exactly thin on the ground for this one.